Stock markets reflect how investors feel about the economy. 1. Is the Total Stock Market More Stable Than the S&P 500? Financial news agencies post the net market gain or loss at the close of each trading day. The U.S. has three major stock market indexes that track the price movements of different stocks. Each index calculates its own net market gain or loss based on the index closing amount for the previous day. If enough stocks in the index rise in price, the market has a net gain. Conversely, if more stocks drop in price, the market has a net loss. Investors and economists use this information to see if the current market trend will last or if a new trend is forming. Net market gain and net market loss are assessments of the closing values of all stocks in an index relative to the same data collected at a prior point in time. The Dow Jones Industrial Average, the NASDAQ and the S&P 500 are the three major U.S. stock market indexes. The DJIA index is made up of 30 of the largest publicly traded U.S. companies. The DJIA reflects the net market gain or loss for the broader US economy. The NASDAQ index reflects the net gain or loss primarily for technology stocks. It tracks 100 of the largest and most actively traded non-financial stocks. The S&P 500 index tracks 500 U.S. large and mid-cap companies. Each index has its own unique way of calculating a net market gain or loss. At the end of the trading day, the index adds up the closing price for each individual stock included in that index. It then divides the total of the stock closing prices by a divisor to calculate the index amount. The divisor is designed to smooth out the effects of stock splits and company spinoffs. For example, the DJIA divides the net total of all the stock closing prices by the Dow Jones divisor. The result is a net market gain or loss for DJIA index stocks. The DJIA, NASDAQ and S&P 500 indexes measure net market gains and losses in points. Calculating a net market gain involves subtracting the current index closing from yesterday’s index closing. For example, say today’s index closing is 100 and the previous day’s close was 85. The net market gain for today is 85 subtracted from 100, or 15 points. This means that the index moved up 15 points compared to the previous day. If the current index close is 100 and the previous day’s close was 110, you have a net market loss of 110 minus 100, or 10 points. 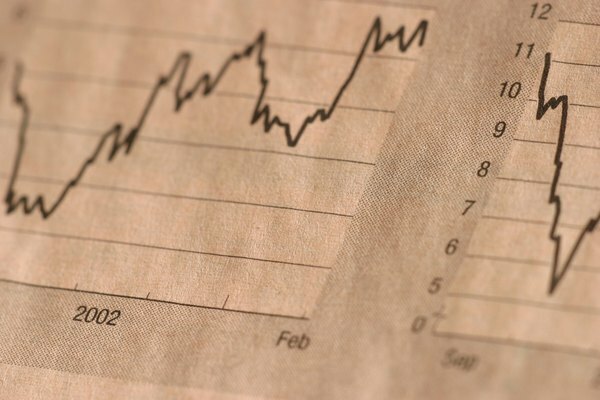 You can use the major market indexes as a benchmark to evaluate your portfolio’s performance. For example, if your portfolio returns small gains while the index consistently posts large gains, you want to find out why your portfolio is under-performing the market. You can also use the index to diversify your holdings so your portfolio returns are on par with the index performance. You can purchase the same stocks that make up the index or invest in a mutual fund or exchange-traded fund designed to replicate the index's performance. Money Crashers: What is the Dow Jones Industrial Average Stock Market Index?